Almost as holy as expression in its many forms, is the fact that, in most countries at least, expression is largely free of limitations, and that even dissenting opinions can, and should be voiced. With this vast freedom, especially in the United States, one can argue that the freedom of expression can be misused and utilized for nefarious means, or to harm others or their more intangible assets such as reputation or notoriety. In any instances where one's reputation is harmed through the freedom of expression (assuming that expression falls within the letter of the law), those parties would clearly want to prevent that speech through any means necessary; even more questionable ones. The attempted curtailment of speech has been discussed on this blog before, but that still leaves the question of can intellectual property rights be used to prevent freedom of expression? A case in the US Court of Appeals attempted to face this very question some decades ago. The case in question was Rogers v Grimaldi, decided in the late 80s, which concerned a movie made by Frederico Fellini for the defendants in 1986. The subject matter of the movie, wonderfully titled as "Ginger and Fred", were two fictional cabaret dancers, Pippo and Amelia, who were known for their imitation of both Ginger Rogers (an Academy Award winning actress in the 1940s, and the plaintiff in the case), and Fred Astaire, who Ms. Rogers often co-starred with in various productions. The cabaret dancers were known as "Ginger and Fred" to their viewers in Italy, and the movie's title, and subsequent plot, refers to their reunion after years of retirement. After distribution within Europe and the US the movie was received rather negatively, and undoubtedly in the wake of this negative publicity, Ms. Rogers sued and claimed false designation of origin under 15 USC section 1125 and a violation of her common law rights to publicity. Effectively what the case is assessing is a balance between free speech and the protection of an individual's (or entity's) rights in their trademarks, albeit more in the context of passing off than registered trademarks (more on which can be found here). Justice Newman presented the question well in the majority's opinion: "Poetic license is not without limits. The purchaser of a book, like the purchaser of a can of peas, has a right not to be misled as to the source of the product. Thus, it is well established that where the title of a movie or a book has acquired secondary meaning — that is, where the title is sufficiently well known that consumers associate it with a particular author's work — the holder of the rights to that title may prevent the use of the same or confusingly similar titles by other authors". In answering this question, the Court of Appeal approached the matter through a balance of public interest and those of any affected parties: "We believe that in general [15 USC 1125] should be construed to apply to artistic works only where the public interest in avoiding consumer confusion outweighs the public interest in free expression. In the context of allegedly misleading titles using a celebrity's name, that balance will normally not support application of the Act unless the title has no artistic relevance to the underlying work whatsoever, or, if it has some artistic relevance, unless the title explicitly misleads as to the source or the content of the work". What Justice Newman's opinion states, is that the potentially misleading title has to apply to the work it represents, or in other words, has to showcase or illustrate the work somehow, and not merely mislead a person to pay for the work thinking it is connected to a potentially affected party such as Ms. Rogers. Arguably this approach is sensible, as the use of IP rights to protect those rights has to be legitimate, just as much as the use of those rights in conjunction with newer works is. Free speech should be promoted through legitimate use, and not stifled merely to further shallow interests such as fame. The Court of Appeal lengthily discuss the nuances of this approaches application, yet, what remains relevant is the use and applicability of those rights to the underlying work, and the legitimacy of that use. Ms. Rogers relied heavily on survey and anecdotal evidence in establishing a claim of false advertising of designation of origin; however this was dismissed handily by the Court: "...the title "Ginger and Fred" surpasses the minimum threshold of artistic relevance to the film's content. The central characters in the film are nicknamed "Ginger" and "Fred," and these names are not arbitrarily chosen just to exploit the publicity value of their real life counterparts but instead have genuine relevance to the film's story". No amount of confusion, arguably at least, will counteract freedom of speech, so long as the use of a name or names is relevant to the underlying work. As such the Court of Appeal dismissed Ms. Rogers' appeal. Freedom of expression poses an interesting balancing act of human rights and commercial interests (or even other human's rights against said expression). The European Court of Human Rights weighed on the issue of copyright interfering with freedom of expression in the case of Ashby Donald and Others v France (case text only in French), and deemed that "...a conviction based on copyright law for illegally reproducing or publicly communicating copyright protected material can be regarded as an interference with the right of freedom of expression and information under Article 10 of the European Convention". Even so, the case saw that the copyright interests asserted did trump the appellants' human rights, as their interests were purely commercial and did not contribute to a specific expression or discussion of opinion. As such, the case can be seen to align with the view that intellectual property rights should not hinder legitimate expression, but can, and should, be used to protect commercial interests. 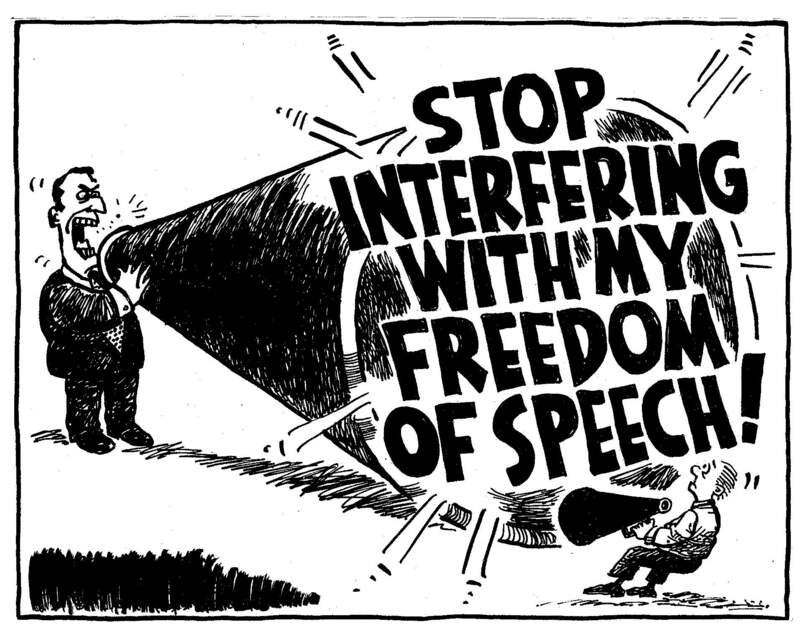 Overall one can appreciate that freedom of speech is seen as a valuable tool for discussion and a strong point of public interest, yet it should not overshadow the protection of some rights, at least in some instances. A blatant use of copyrighted material, or trademarks, for the purposes of making a quick buck should be dissuaded; however one man's folly should not silence a nation.